When light travels from one medium to another, it bends, or refracts. 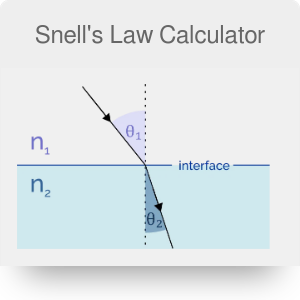 The Snell's law calculator lets you explore this topic in detail and understand the principles of refraction. Read on to discover how the Snell's law of refraction is formulated and what equation will let you calculate the angle of refraction. The last part of this article is devoted to the critical angle formula and definition. Θ₂ is the angle of refraction - the angle between the normal to the boundary and the ray traveling through medium 2. Let's assume you want to find the angle of refraction of a light ray that travels from air to glass. The angle of incidence is 30°. Find the index of refraction of air. It is equal to 1.000293. Find the index of refraction of glass. Let's assume it is equal to 1.50. Transform the equation so that the unknown (angle of refraction) is on the left hand side: sin (Θ₂) = n₁ * sin (Θ₁) / n₂. Perform the calculations: sin (Θ₂) = 1.000293 * sin (30°) /1.50 = 0.333. Find the arcsin of this value: Θ₂ = arcsin (0.333) = 19.48°. You can also save yourself some time and simply use the Snell's law calculator. Sometimes while applying the Snell's law of refraction, you will receive the sin (Θ₂) as a value greater than 1. This is of course impossible - our Snell's law calculator will display the value as "NaN". If this happens, it means that all light is reflected from the boundary (this phenomenon is known as the total internal reflection). After simplification, n₁ * sin (Θ₁) = n₂ * 1. Solving for the angle of incidence, Θ₁ = arcsin (n₂ / n₁). Snell's Law Calculator can be embedded on your website to enrich the content you wrote and make it easier for your visitors to understand your message.